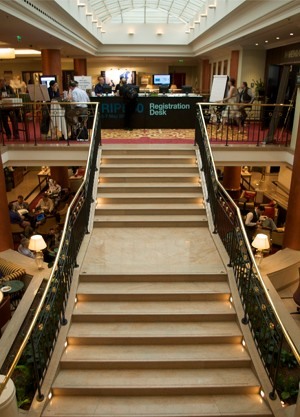 The RIPE 60 Meeting was held from 3-7 May in Prague, Czech Republic. The final attendee count of 427 means that this is the biggest meeting so far. For a quarter of attendees, this was their first RIPE Meeting. Overall, attendees came from 44 different countries. Rob Blokzijl, RIPE Chair, opened the meeting on Monday afternoon with the message that RIPE 60 looks set to be one of the biggest RIPE Meetings so far. Rob also informed the attendees that a draft "Community Statement about IPv6" will be circulated on the RIPE mailing list and the Cooperation Working Group mailing list. This statement was then discussed in Wednesday's Cooperation Working Group. The meeting host, cz.nic, welcomed the attendees to Prague, and then the first plenary session of the week began. The theme of the session was DNS, with an update on "Root DNSSEC Signing" by Matt Larson and Duane Wessels. There were also presentations on "Trusted Community Representatives Proposed Approach to Root Key Management" by Rick Lamb and "Applicability of add-paths Scheme" by Robert Raszuk. The final plenary session of the day featured presentations on BGP in 2009 by Geoff Huston, which prompted lively discussion, "Using Route Servers" by Elisa Jasinska and "The RPKI & Origin Validation" by Randy Bush. Ondrej Filip presented "DNSSEC in CZ" and announced that .cz has the most DNSSEC secured domains in the world. In addition, Suzanne Woolf talked about "DS-Lite" and asked for volunteers to test the system. The RIPE Certification Task Force met on Monday morning before the meeting to discuss the RIPE NCC resource certification policy proposal currently in development. The meeting resulted in a new draft of the proposal, which was presented to the community for discussion during the Address Policy Working Group later in the week. The first day of the meeting was rounded off with the Welcome Reception, sponsored by Netnod. Attendees gathered for drinks and snacks in the meeting venue to discuss the day's events. Tuesday's first plenary session featured updates from each of the Regional Internet Registries (RIRs), the Number Resource Organization (NRO) and the Address Supporting Organization (ASO) Address Council (AC), as well as a presentation of joint allocation and assignment statistics from the five RIRs. In the second plenary session of the day, Benno Overeinder presented the preliminary results of NLNetlabs Secure Routing Survey and asked for feedback. Leslie Daigle's presentation on ISOC's IPv6 Deployment Day was well received and prompted some discussion. Per Blixt from the European Commission presented the preliminary finding of the Commission's IPv6 study and its Action Plan for Deployment of IPv6 in Europe. There was lots of interest in the findings and he asked that people provide him with their feedback on the study. After lunch, George Michaelson gave an entertaining presentation on the traffic seen to and from 1.0.0.0/8, which highlighted some of the problems being faced as the final blocks of IPv4 address space are allocated (PDF). Amund Kvalbein presented the results of a six-year study on BGP churn. Ben Stasiewicz then spoke about his experiences with Path MTU Discovery in IPv6 at the University of Waikato and invited attendees to take part in the PMTUD test. The IPv6 Working Group met during the final session of the day, with a packed agenda that included Marco Hogewoning's overview of Customer Premises Equipment (CPEs), Emile Aben's analysis of IPv6 at Web Clients and Caching Resolvers, Jan Zorz's discussion of Mobile Broadband and IPv6 in Slovenia and a round-up of global IPv6 policies from Filiz Yilmaz. The session concluded with a fruitful, open discussion of the way forward for the IPv6 Working Group, and how best to encourage the accelerating adoption of IPv6. Tuesday's social event, sponsored by nix.cz, took place in the atmospheric Sacre Coeur. Live music, great food, cocktails and traditional Czech crafts made the evening a great success. Two Address Policy Working Group sessions were held on Wednesday. A couple of main points in the proposal 2010-01, "Temporary Internet Number Assignment Policy'" were highlighted: timeline and fair assignment mechanisms. The discussion will continue on the Address Policy mailing list. Comments on proposal 2010-02, "Allocations from the last /8", were collected and led to comparisons with the other RIRs. The main focus of the discussion was on whether the proposed policy should come into effect immediately when the RIPE NCC receives the last /8 or later, when the equivalent of /8 is left in the RIPE NCC's pool. Proposal 2010-03, "Global Policy State in RIPE PDP", was also discussed and will be discussed further on the mailing list. Several comments and various opinions were expressed during the discussion on the differences between IPv4 and IPv6 PI assignments. The working group decided that it was important to continue to consider the two protocols separately so that the deployment of IPv6 can be supported. There also seemed to be not much need to change the wording of the PI policies as they stand today. Rob Blokzijl also made a presentation on the text, "Principles for Number Resources Registration Policies", to solicit the production of a registration policy. This text, written by Rob and Daniel Karrenberg, was distributed to the RIPE mailing list earlier on Wednesday. The text was meant to define the role of the RIPE NCC as registry, particularly after the unallocated IPv4 address space runs out. The presentation received a good response, with most of the audience welcoming the initiative and stressing its importance in relation to other policy proposals already in the PDP. The Cooperation Working Group filled its afternoon slot with discussions on the preparations for IGF 2010 and the IP address management aspirations of the International Telecommunications Union (ITU). The Working Group approved a draft statement from the RIPE community on IPv6 and the ITU, which was subsequently presented to the community for final discussion in the Closing Plenary on Friday. The document for IPv6 routing recommendations resulted in lengthy discussions, just as at RIPE 59. Consensus was reached in order to further improve the document in regards to aggregation and filtering recommendations. The survey produced by Benno Overeinder and Maarten Botterman triggered a lot of discussion on different ways of implementing routing security on the Internet. Arne Kiessling gave an update on the 2007-1 project which prompted suggestions from the audience on ways to facilitate finding the users of orphaned resources. The RIPE NCC was asked to send information about the next steps of this project to the RIPE NCC Services mailing list before the RIPE 61 Meeting. Mirjam Kühne also gave an update on RIPE Labs and Robert Kisteleki gave an overview of allocation and assignment trends. Wednesday's social event, sponsored by Interexion, took place in Mazanej Kralicek, a bar that borrows its name and theme from the diner in Pulp Fiction. Three floors of music, classic American cars and an impressive range of cocktails ensured that the RIPE Meeting 'party night' didn't disappoint. Paul Palse provided an update from the RIPE NCC and demonstrated the new RESTful query interface to the RIPE Database. The "ping-c:" attribute proposal from the RIPE Routing WG was briefly discussed and the RIPE NCC said that it was relatively easy to implement. There was some interest from the attendees about this idea and the Database WG will wait to hear further from the Routing WG. The Test Traffic Working Group agreed on a new charter and will relaunch itself at the RIPE 61 Meeting in Rome as the Measurement Analysis and Tools (MAT) Working Group. Henk Uijterwaal stepped down as co-chair after serving in this role for 12 years. Richard Barnes and Christian Kaufmann volunteered to join the remaining co-chair, Ian Meikle, and were accepted as new co-chairs by the session attendees. Serge Radovic shared news from Euro-IX and presented a newly developed ASN Filter tool. He also invited everyone to view the latest edit of the film "The Internet Revealed: A film about IXPs" online at: http://www.euro-ix.net. Nick Hilliard's presentation highlighted the lack of new information contained in the IXP updates and suggested that more pieces of news as well as updates from new IXP's be presented. In the second EIX WG's session, Vincent Rais gave a presentation on Business Models for IXPs. And, Andy Davidson's presentation on TRILLing prompted a number of questions from the audience and from the Jabber channel. The progress of policy proposal 2008-08, "Initial Certification Policy for PA Space", was discussed, mostly on the topic of whether to manage certificate revocation on the re-issuance or on the reclamation of Internet resources. The discussion was moved to the mailing list. Global policy proposal 2009-01, "Allocation of IPv4 blocks to RIRs", was discussed and the differences in wording for some regions was considered. The RIPE community has almost reached consensus on the original text, as per the Address Policy mailing list discussions, and the general feeling of the audience was to move forward. Later on, in order to avoid misunderstandings on the requirements of the 80% usage for PA allocation request, a clean-up of the wording of policy ripe-492 was proposed and will start its way through the PDP. An informal proposal to change the current 80% utilisation rate requirement to a higher value did not receive much support based on the argument that it is probably too late to be useful due to the IPv4 depletion rate. It was standing room only at both sessions of the DNS Working Group. An equally packed agenda encouraged lively debate. The hot topic throughout was DNSSEC and the need to create robust signing tools and encourage their use. Co-chair Jim Reid thanked everyone involved in the ambitious project to deploy DNSSEC across all root servers. Richard Cox gave an update on network abuse, detailing snowshoe spam and cybercrime. Recent list discussions were reviewed and a discussion on abuse contact information will be put into the formal PDP. Jochem de Ruig presented on interaction with law enforcement agencies (LEAs) and Wout de Natris presented from the London Action Plan (LAP), an international spam enforcement network. Alex le Heux also presented an idea about publishing quarantined blocks, which generated a lot of discussion. On Thursday evening, a PGP key-signing party organised by Wolfgang Nagele was held. Ten people participated and the general feeling was that this should be made a regular part of RIPE Meetings. A key signing party involves participants reading out their PGP key fingerprints to others. Then participants show each other a form of identification, such as a passport or national ID card. If they are satisfied that a participant is who he or she says he is, then they can sign that PGP key, and thereby trust it. PGP key signing parties help build a web-of-trust for PGP. The RIPE 60 Dinner, sponsored by cz.nic, took place at Slovansky dum, an important historic Prague monument. The dinner was held in an impressive location and featured a futuristic fashion show, a sit-down dinner, cocktails and a big band. The ENUM Working Group session kicked off the last day of the RIPE Meeting with some interesting presentations. Working Group co-chair Niall O'Reilly gave the ENUM update and Anand Buddhdev gave the RIPE NCC ENUM Update. Syarul Emy Abu Samah from .my domain registry then joined live from Malaysia to give an update on Malaysian ENUM that received high praise from attendees. There was good interaction between the attendees in Prague and the presenter in Malaysia. The final presentation of the session came from Bernie Hoeneisen, co-chair of the IETF ENUM Working Group, who presented "E2MD - Another DDDS". E2MD allows metadata mapping to extend the information that can be placed in the ENUM tree, and this led to some healthy discussion on the merits of the system. Roland Perry presented a draft "RIPE Community Statement on the Internet Address Management System". This statement will be sent to the ITU to reinforce that the RIPE community believes that the current address management system works. Rob Blokzijl asked the attendees if they agreed with this statement. There was consensus in the room. The IPv6 Working Group reported that the WG has been rechartered. New co-chair Marco Hoogewoning also announced that there is a new contact address for the WG Chairs (ipv6-wg-chair@ripe.net) and another new co-chair, Shane Kerr, who could not attend RIPE 60. The new Measurement Analysis and Tools (MAT) Working Group, formerly the Test Traffic Working Group, announced its name change and a new broader approach to its work. The "Report from the Secret Working Group" and a "Closing Address" from the RIPE Chair, Rob Blokzijl, closed the meeting. We hope to see you all in Rome, Italy. RIPE 61 is held from 15-19 November. RIPE (Réseaux IP Européens) is a collaborative forum open to all parties interested in wide area IP networks. The objective of RIPE is to ensure the administrative and technical co-ordination necessary to enable the operation of the Internet within the RIPE region. There are no membership requirements for participation in RIPE. Its activities are performed on a voluntary basis and decisions are formed by consensus. Work is carried out within a variety of working groups. Each of these working groups has one or more mailing lists where relevant topics and questions are discussed. RIPE Working Groups meet throughout the year during RIPE Meetings.